Located in Toulouse, Europe’s space capital, Cité de l’espace is a unique and lively place for sharing space adventures. 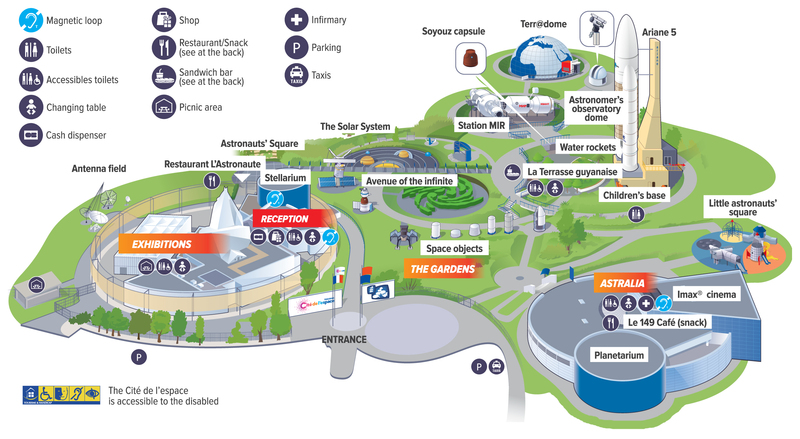 Cité de l’espace, which spans 5 hectares, has welcomed over five million visitors in its fifteen years of existence; it is Europe’s premier astronomy and space science culture center. Toulouse-Blagnac airport is the 5th largest airport in France. It provides direct flights to 87 destinations, 73 of which are international flights. There are 72 flights a day between Toulouse and Paris (flight time: 1 hour). A large number of rail links have long been running between Toulouse and other French cities (Bordeaux, Montpellier, Lourdes, Biarritz etc.) as well as Paris. There is also a very well-developed network of regional trains linking Toulouse to all the other large towns in the Midi-Pyrénées region and also to major towns in other regions (Carcassonne in Languedoc-Roussillon, Pau and Agen in Aquitaine etc.). Toulouse lies on a crossroads of many motorways: to the north, the A62 towards Bordeaux and the A20 to Paris; to the west, the A64 towards Biarritz; to the south, the A66 towards Barcelona; and to the east towards Montpellier (A61) and Albi (A68).